When you order an AltRider product, we know you want to put it on your bike as soon as possible. That’s why we ship every weekday, excepting U.S. national holidays. Most items will usually ship within 24 hours of the time you placed your order. Some products require extended delivery time; in such cases, we will contact you to let you know. If your order is needed by a specific date, please call us at +1 (206) 922-3618 and let us know that your order is time sensitive. We will help you choose the best shipping method for your situation. 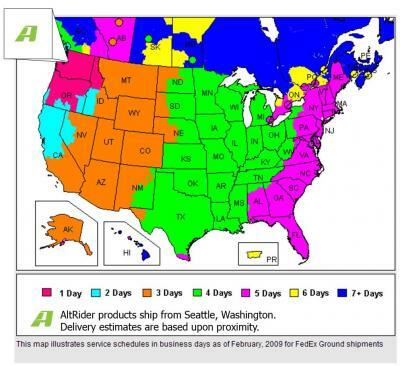 Please note that although we will do everything in our power to make sure you get your AltRider merchandise quickly, once packages leave our warehouse, the carrier controls delivery schedules and we cannot guarantee a delivery date. Our pricing is in U.S. currency. We accept payment by credit card (Visa, MasterCard, American Express, and Discover). Once your order is processed and shipped, we are unable to cancel, add or change it. However, if you contact the AltRider office before the order is packaged we will try to make any adjustments that are within reason. Products requiring an extended delivery time may sometimes be altered if caught before processingand shipping. Fees paid for shipping and handling are not refundable. Please review our Returns and Exchanges Policy.